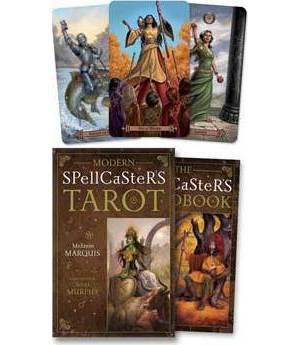 Accredited Tarot author Melanie Marquis and well known fantasy illustrator Scott Murphy have combined their extraordinary talents to create a 78 card Tarot deck for the modern magical practitioner based on the Rider-Waite archetype. Steeped in traditional pagan symbolism and ethnic diversity this inspiring deck may invoke and stimulate the third eye while strengthening one's skills of divination. The 264 page companion book includes detailed card descriptions, traditional style tarot spreads, as well as instructions for receiving more information about specific situations. It also contains information on how to utilize the cards in magical workings such as; drawing energies together by placing the cards that represent them face to face, reversing a card to manifest major change or a reversal, and creating a ladder of cards to represent progression towards a desired outcome. This boxed kit measures 5 inches by 8 inches by 2 inches.